Whether it's time constraints, mechanical issues or a dread of "the bash," shipping one's boat home could be the answer. After you’ve soaked up all the fun and relaxation you can handle in Mexico or points farther south, you might want to ship the boat back to the U.S. or Canada. Why? 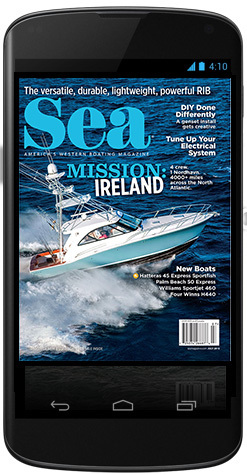 Southbound voyages along the eastern Pacific, whether a boat is power or sail, are generally easier than northbound, due to prevailing northwesterly winds and long-shore currents that generate adverse conditions known simply as “the bash.” Each year, several hundred boat owners plan their tropical cruising itinerary to conclude by shipping or trucking the boat north. It’s not cheap, but neither is your time. Each shipping company (see To the Web sidebar) has its own methods, equipment, destinations, routes and schedules, so each boat owner will want to visit shipping company websites, watch their videos, get quotes and compare their services. Land truckers use a crane or sling lift and a trailer to transport one boat at a time — usually under 65 feet LOA — from one port to another, most notably across international land borders. 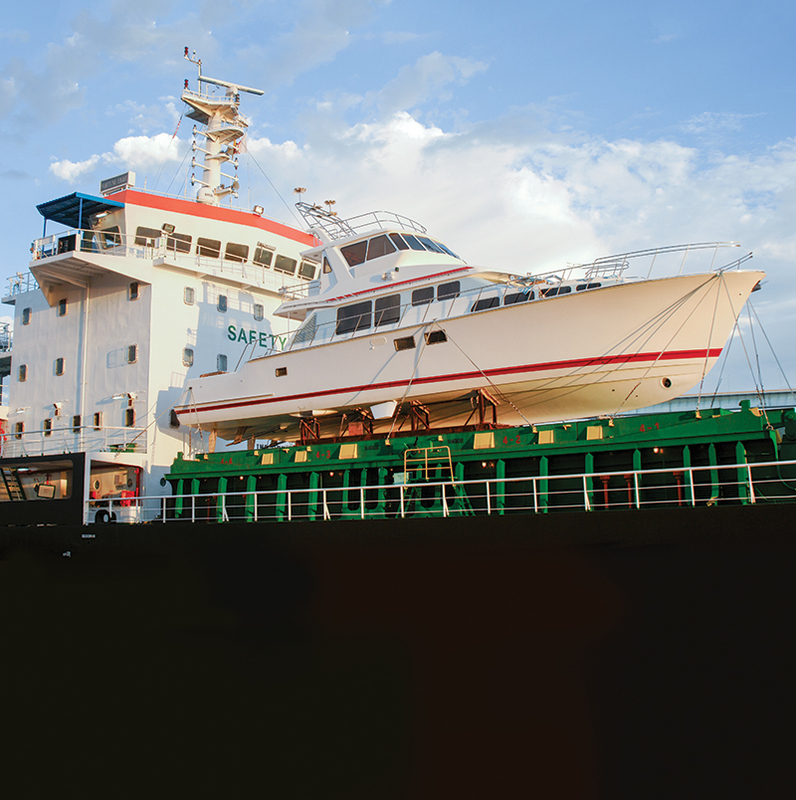 By sea, one popular method known as “float on, float off” employs a ship with a special dry-dock deck that is submerged and filled with yachts secured in welded cradles and then raised for dry transport. A third method, “lift on, lift off,” uses giant cranes and sets of sling straps to load yachts onto ship decks or into cargo holds. When do you think you’ll be ready to ship your boat home? If you’re staying for just one winter cruising season, that means getting the boat north before hurricane season begins, such as May or June. Where are the shippers’ regular pickup and drop-off ports that fit into your itinerary? Investigate, because they differ slightly. However, if the owners of four or five big yachts seriously request to be picked up in a different port, one of these shippers may be able to accommodate them. San Carlos and Puerto Penasco in Sonora have reliable truck transports across the U.S. border, eliminating at least 1,100 sea miles. Mazatlan is another possibility in the Sea of Cortez. La Paz is the most popular port from which to ship boats north, eliminating the infamous Baja Bash, with disembarkation points in Ensenada, Los Angeles, San Francisco or Seattle, depending on the shipper. A Manzanillo pickup gives owners the opportunity to explore the Sea of Cortez and Gold Coast before shipping the boat north. Golfito, Costa Rica, is the primary pickup port in Central America, amid fabulous sportfishing resorts and jungle preserves. Owners could coastal cruise through the Panama Canal and get their boat shipped back north. How far north? The Jones Act makes it expensive to access multiple U.S. West Coast ports, but most shippers make dropoffs in Victoria or Vancouver, B.C. Given the timing of getting out of Mexico by June, it’s the ideal time to begin a cruise through the San Juan or Gulf Islands and up the B.C. coast to Alaska. 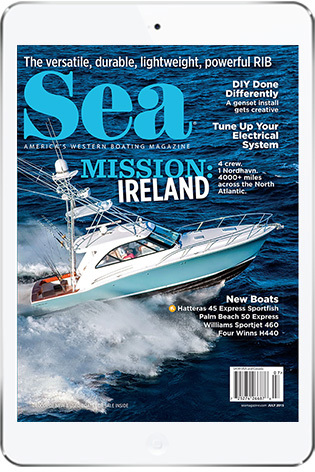 Many trawler yacht owners do this every year: slowly cruise Mexico during winter and spring, then get shipped up to the Pacific Northwest to begin the summer season. 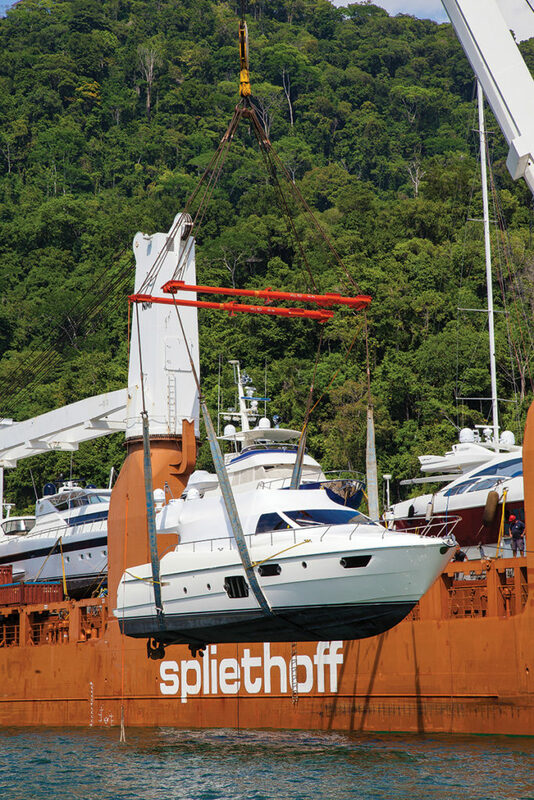 Ft. Lauderdale, Fla., is a regular drop-off and pickup port for international yacht shippers. So after cruising Mexico and Central America, yacht owners could get picked up in Costa Rica or Colon, Panama, and dropped off in south Florida, the Bahamas or Gibraltar. Two months in advance of the pickup date, finalize all the paperwork and make the payment. Owners whose yacht will be transiting multiple countries (e.g., Costa Rica to Canada) should consult their customs agent, say owners who have shipped their yacht multiple times. No matter which method you pick, follow the shipper’s instructions for preparing the boat. 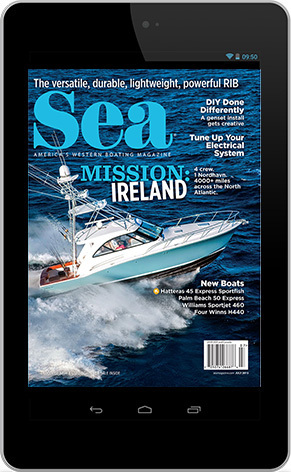 Exact measurements of your boat’s LOA, height, beam, draft and weight (not tonnage) are crucial. Lighten it by emptying all the tanks; retain just enough diesel to offload in port, but no jerry cans. Empty bilges dry and turn off pumps. Secure the dinghy, the crane, the radar antenna, vinyl windows and flopper poles. Remove exterior gear such as the anchor, cushions and deck chairs. Tape hatches closed, lock ports and disconnect batteries. Wax the stainless steel and cover the rails. Consider having the hull shrinkwrapped. On the interior, secure everything that might move: drawers, doors, lamps, chairs, window shades, picture frames, small appliances, glassware, canned goods. Empty the refrigerator and freezer. Remove plants and pets. For trucking, a height limit of 12 feet, 6 inches is common; some boaters drop their dodger, arch, Bimini and/or T-top. For containerized cargo, determine if your swim step and bow pulpit put the boat over the length limit, which is usually about 38 feet. For sea shipping, hang at least eight beefy fenders — four on both sides, two each on the stern and bow — and make ready four 50-foot lines for the sides, stern and bow. Follow the load master’s instructions. For a boat larger than 90 feet, the shipper may require one or two responsible people — remember passports and visas — to ride along and take meals in the ship’s quarters but sleep on the boat. Each shipper has different rules. Immediately after launch, get the boat to the nearest marina (make a slip reservation) or diesel dock, because it will need fuel, water, provisions and a good scrub. If you shipped the boat due to propulsion trouble, arrange a local tow, because you can’t make repairs while it’s aboard the ship. I used United Yacht Shippers and other than delivery date changing, due to ships cargo pick-up ports added, I was completely satisfied, no damage to my 53′ yacht and dropped in Ensenada with all necessary paperwork ready for me.